and upload YOUR photos too! Wildlife has been present for centuries in South Africa, but over-explotation of game and the the introduction of commercial farming caused a dwindling in game numbers. Over the past few decades the numbers of game have increased drastically since a monetary value has been put on game: " If it pays it stays". Game ranching may be pursued for a number of reasons: to generate a profit; to diversify farming activities;the need for business executives to combat stress; or the desire to own a small piece of land and manage it in an ecologically sustainable manner. Game ranching is multii-facetted which includes biological, ecological, tourist and financial elements. The sustainability of natural resources by means of trophy and/or vension hunting, the culling of surplus animals or capture and live sales at auctions are some of the ecological aspects invovled. Ecotourism includes game viewing and managing game lodges. All of these facets have financial implications. Since the 1990s, farmers have started to create conservancies ensuring sufficient minumum size for game ranches. Conservancies consist of a group of adjoining private commercial farms that operate under a co-operative management agreement based on a shared common goal, such as to conserve and enhance the biodivertsity of the ecosystem and to realise its full economic potential on a sustainable basis. The removal of internal fencing between adjoining ranches and farms are called for to realize this goal. • To determine homogenous and topographic areas. • The classification of the vegetation. • Determination of veld condition and grazing capacity. • Determination of browsing capacity. • Determination of a veld burning regime. Pride of Africa is registered as Pride of Africa Nature Reserve (Pty) Limited and consist of a number of co-owners that are shareholders/members of the company. Members of the company have rights to construct a lodge enabling them to stay on the reserve for a maximum of 3 months on the reserve, however most of them use it as a weekend or holiday retreat. Members are allowed to construct a bush type dwelling that comply to set standards on their privately owned plot. Game that permanently resides on the reserve are: giraffe Giraffa camelopardalis, kudu Tragelaphus strpciseros, eland Tragelaphus oryx, gemsbok Oryx gazella, waterbuck Kobus ellipsiprymnus, red hartbees Alcelaphus buselaphus, impala Aepyceros melampus, bles bok Damaliscus pygargus phillipsi, wildebeest Connochaetus aurinus, zebra E quus burchelli, duiker Sylvicapria grimmia, steenbok Raphicerus campestris and warthog Phacochoerus africanus. A wide variety of bird species can also be found on the reserve. 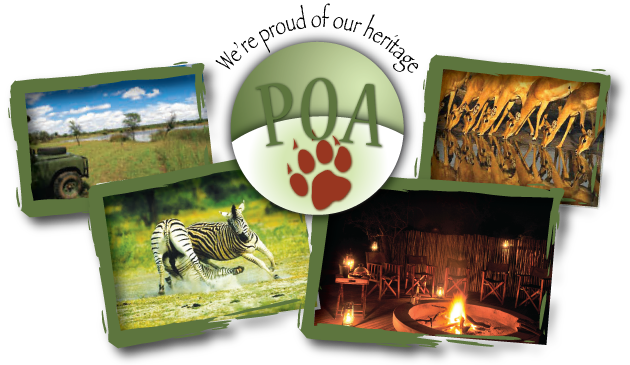 Pride of Africa Nature Reserve is situated in a mixed Bushveld ecozone. The area comprises mostly undulating to flat plains at an altitude of 700 to 1 100 m above sea level. Rainfall is between 300 and 500 mm per year in the form of thunderstorms. Summers are hot, reaching temperatures of 35°C by day and dropping to 16°C at night. Day temperatures in winter reach a maximum of 25°C , but night temperatures can drop to about 6°C, with occasional frost. The area is used for game, farming, as well as ecotourism. Vegetation is very varied within the ecozone. Dense thorn thickets of Acacias on clay soils change to more open plains, with large Syringa Burkea that are conspicuous on sandy soils. Fire and grazing are the main determinants of the structure of the vegetation type. The low rainfall of the area is not supportive of dense, uniform strands of grasses. Irregular frost does not cause damage to the trees. Pride of Africa Nature Reserve is situated approximately 12 km from Hammanskraal on the road to Rust de Winter, between southern latitudes 25° 16' and 25° 20', and eastern longitudes 28° 22' and 28° 25'. In total, Pride of Africa Nature Reserve covers an area of 2043 ha. The common property that is owned by the owners of the Pride of Africa Nature Reserve (Pty) Ltd. company consists of 1285.84 ha. The reserve further consists of adjoining properties that are privately owned and covers an area of 734.66 ha. On the southern side of the reserve an area of 60 ha with 22 plots exist on which lodge development can take place. Climate, in the broad sense, can be seen as the major determinant of the geographical distribution of species and vegetation types. Climate indirectly affects the stocking rate of an area and will determine the number of animals as well as the type of animals that can be sustained on the reserve. Vegetation is water dependant, rendering rainfall as one of the most important factors that influences the productivity of vegetation. Water is important in maintaining both plant and animal life. The availability of water will infuence management decisions to a great extent. A positive and generally linear relationship exists between rainfall and the production of herbaceous dry matter. The dry season stretches from middle April to middle September. The wet season commences from middle September stretching ot middle April. Temperature has an influence on the rainfall and moisture of an area. Plants are very sensitive to fluctuations in temperature. Temperature data from the Settlers: Landbouskool weather station (AgroMet no: 0590/087L; Latitude: 24°05' South; Longitude 28° 32' East; Altitude 1050 m) is considered appropriate to the Pride of Africa Nature Reserve. Summers are hot, while winters are mild with cold mornings and evenings. The mean annual temperature for the past 19 years (1979 till 1998) is 20.6°C. Just north-east of urban Joburg and Tshwane lies the vibrant and warm, big-sky region of Dinokeng, where the world's largest diamond was discovered. Today the area is sparkling with natural, cultural and historical attractions, a place where South Africans and their visitors enjoy the outdoors and the history and culture of Africa.